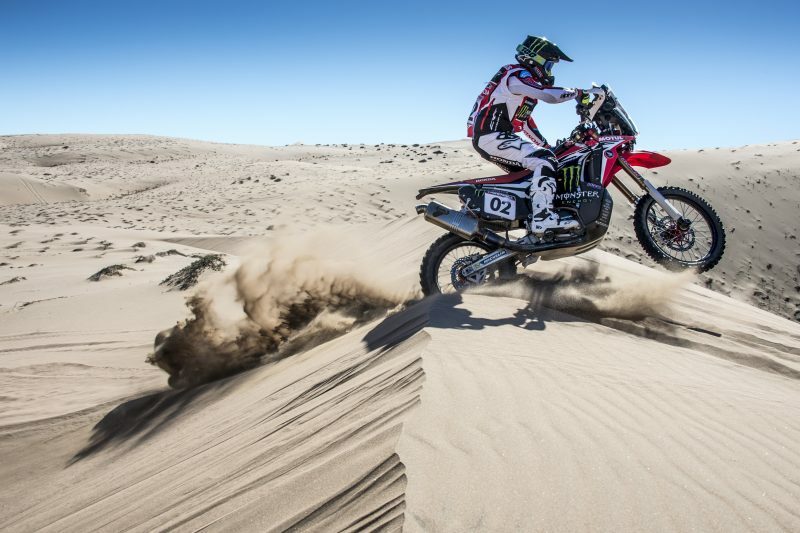 Monster Energy Honda Team got to grips today with the first full stage of the Atacama Rally, grabbing a decisive win for Kevin Benavides in the dunes of Copiapó. 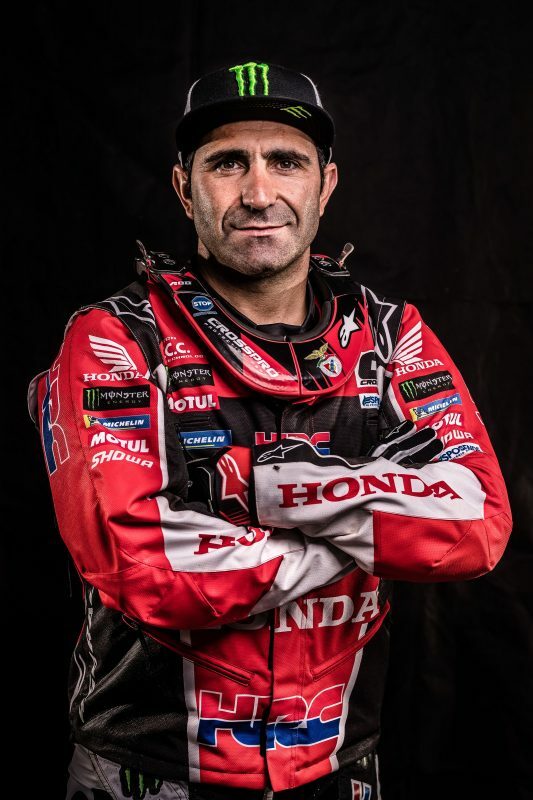 Joan Barreda suffered a heavy fall that saw him obliged to drop out of the race. 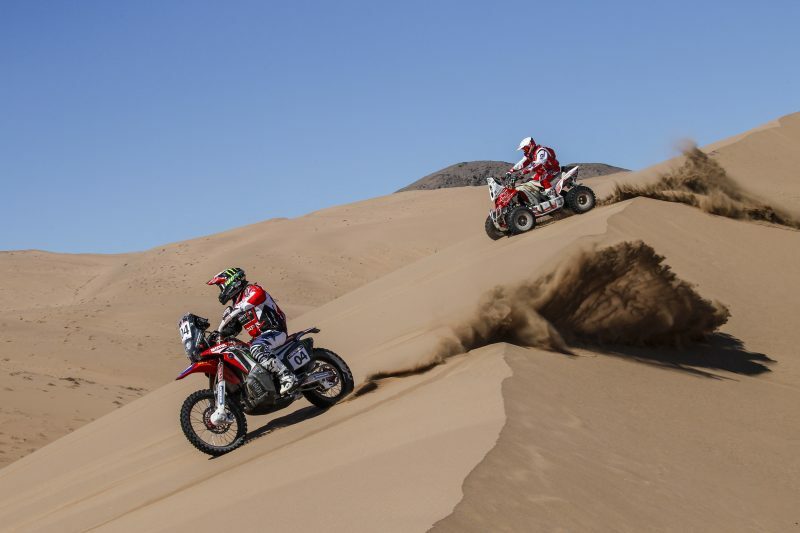 Yesterday’s short afternoon prologue in Tierra Amarilla, a town just fifteen kilometres from Copiapo, brought some surprises, as the top riders were at their smartest strategically, to avoid starting out from the front when the first stage of the competition got underway. 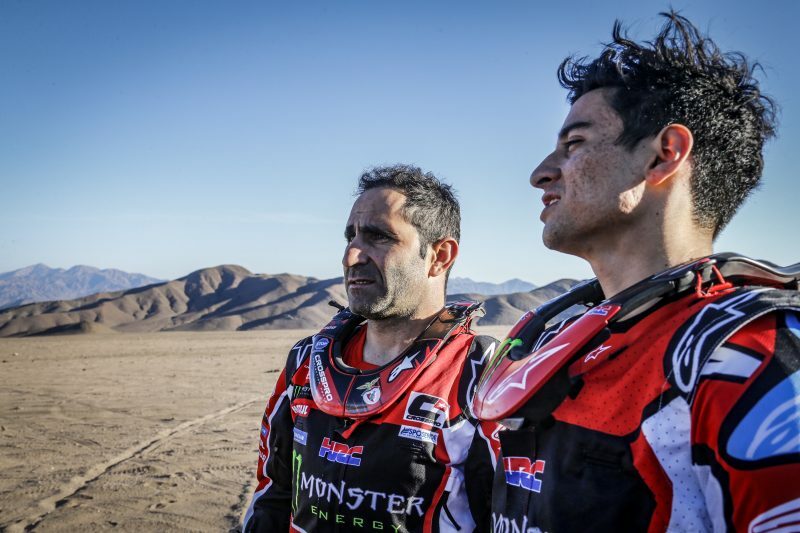 Thus, Paulo Gonçalves, José Ignacio Cornejo, Joan Barreda and Kevin Benavides all chalked up less-than-their-best qualification times, which paid off in the form of optimal starting positions for today’s first stage, most posting twenty-fifth place or more. 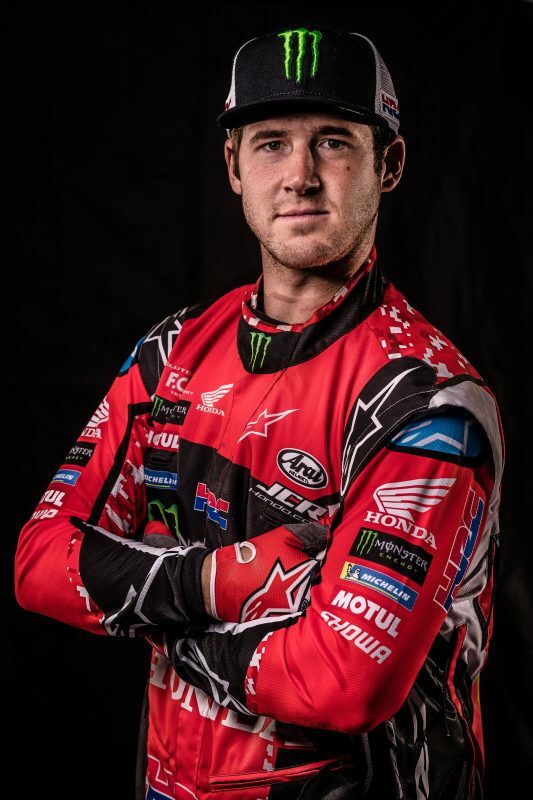 Ricky Brabec finished tenth in the prologue which meant the American was the first of the Monster Energy Honda Team riders to take the field, eventually producing a fifth overall position. 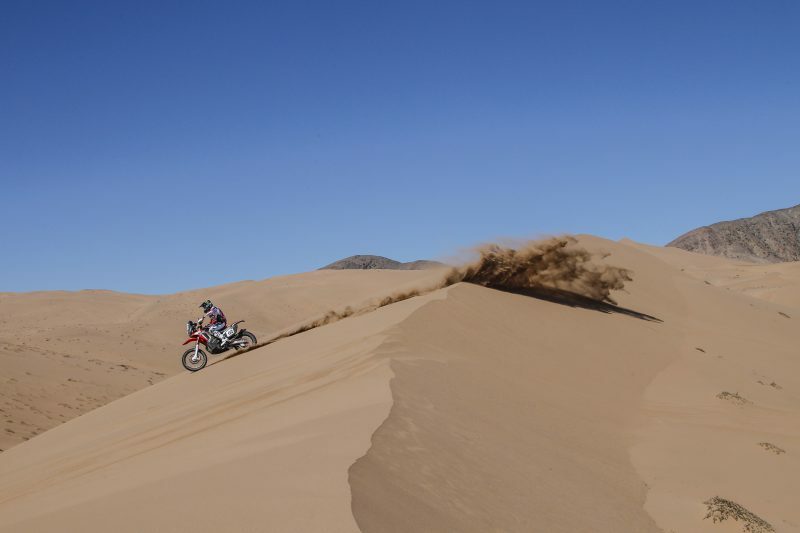 Today’s looping special, beginning and ending in Copiapó, took in a total of 266.30 kilometres against the clock. The rest was made up of 91 kilometres of liaison to form a total of 358.87 kilometres. 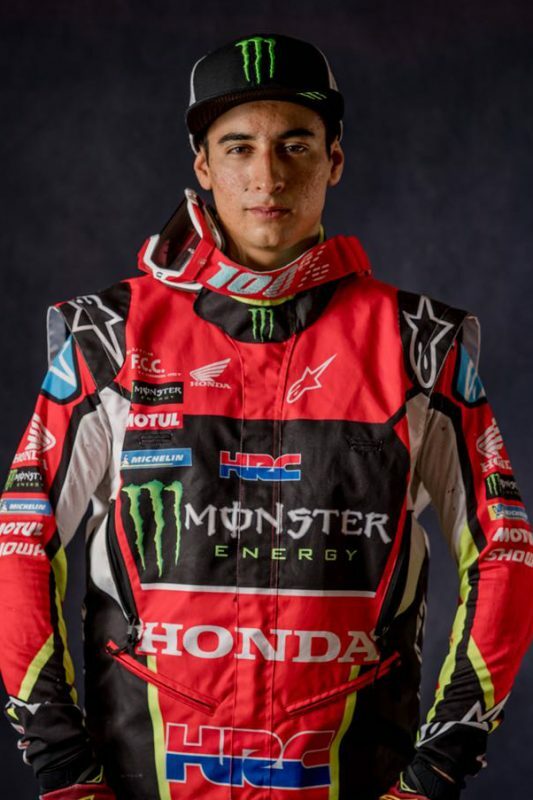 By the time the stage was done, the fastest of all the participants had proved to be Argentine Monster Energy Honda Team rider, Kevin Benavides. The delayed start benefited the rider who was been able to set a formidable pace, strong enough to post the day’s best time. However, with the addition of the prologue time, Kevin now lies in second spot in the overall standings. 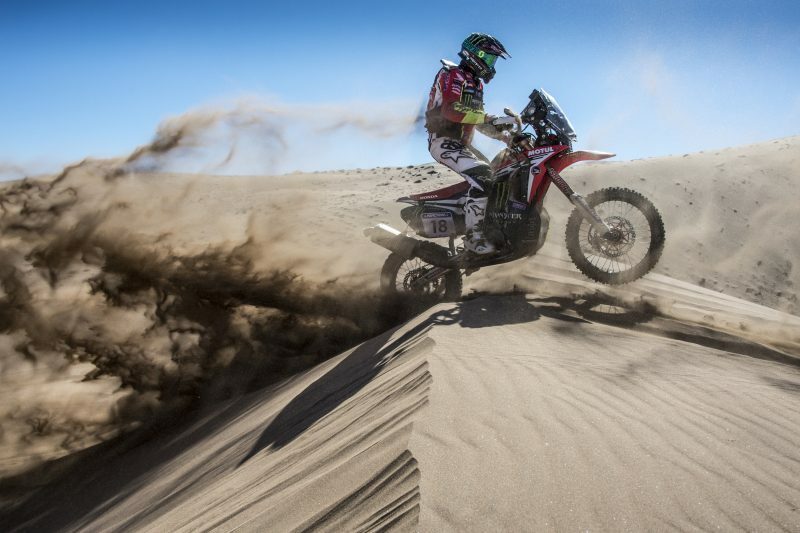 Paulo Gonçalves experienced some navigational hiccups today which saw him drop some time before finishing eighth. Meanwhile American rider Ricky Brabec found himself opening the track during the first kilometres of the special. The Californian made it through to the flag with an error-free ride and continues to accrue valuable navigational experience. Ricky finished ninth on the day. The young Chilean Jose Ignacio Cornejo set a solid pace but lost time due to a fall which meant that he finished the day amidst the group of his team-mates, in tenth place. 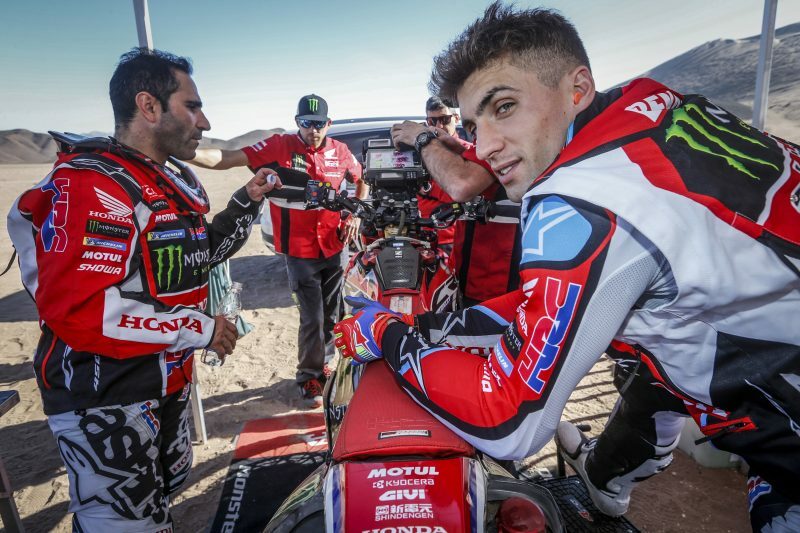 Bad luck for Joan Barreda, who started very strongly in the opening stretches of the race, but a fall at kilometre eight of the special left him in bad physical condition. 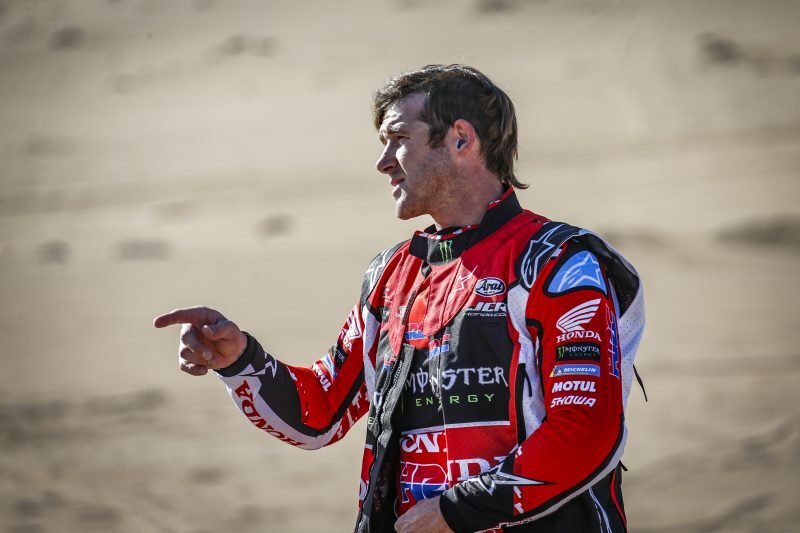 The Spanish rider was able to continue until the neutralization section but at that point was forced to retire from the rally. 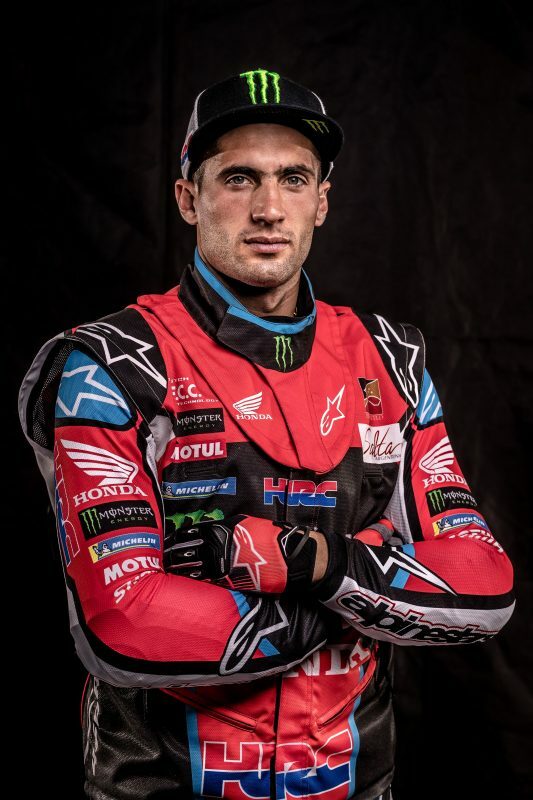 The rider is currently under observation checks to ascertain the full extent of the injuries sustained in the fall. 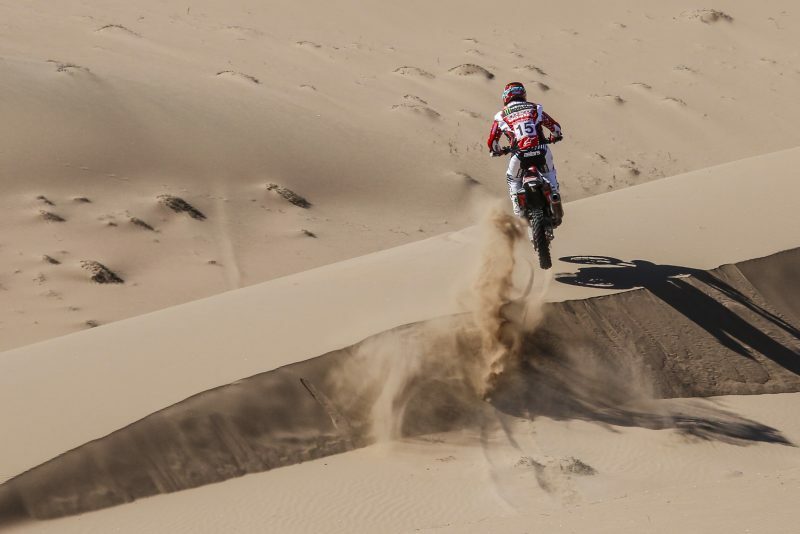 It was a good stage, I came from behind, trying to take advantage of some of the tracks. I also had to navigate because I saw that there were people who had got lost and there were tracks everywhere. Good pace, good feelings, and a good level of concentration throughout the race. Physically I’m fine, too. I am happy with this first stage and I hope to continue in this vein. There’s still a long way to go. 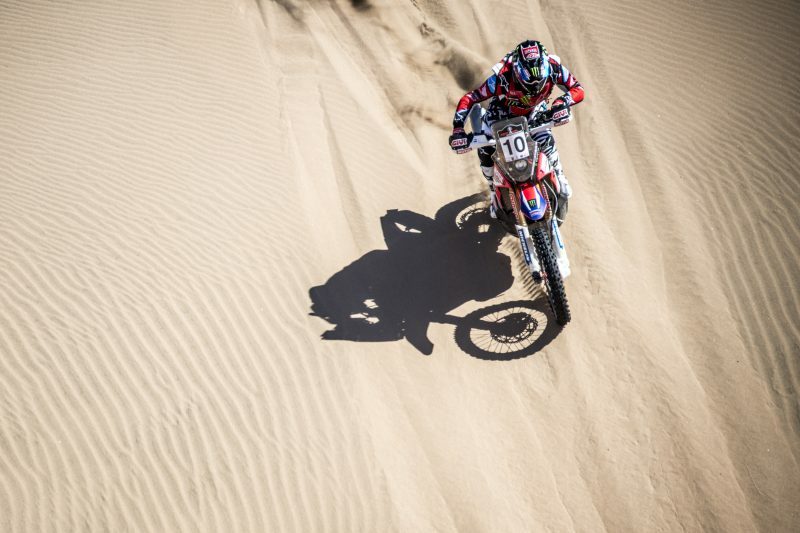 Today was an interesting stage, with many dunes and lots of sand, fast track and at the end some trial-style track too. I tried to keep a good rhythm but I made some navigation mistakes which cost me some time. I’m happy with the performance of the bike, which has been perfect. I also stopped to help Nacho. For tomorrow I hope to make up some time and hopefully get up with the top riders. Stage one was the start of the rally. This is maybe my third time opening the course. Today was actually really good. I had a few difficulties in a few of the spots, but I managed to stay calm and get through them. Eventually Quintanilla caught me up. It’s really hard to beat him out here on his own ground. We’re not sitting as bad as I had expected. So we’ll pick it up over the next few days. I finished the first day of the race. It was good with good pace, but I had a hard fall that, fortunately, was without any serious consequences. I was able to continue but it was hard for me to pick up the pace again. I do not think I lost a lot of time, so we have to be ready to regain ground over the four remaining days. For editorial use only, click here to download images.